You'll be £9.50 closer to your next £10.00 credit when you purchase Ipswich in the Great War. What's this? Order within the next 28 minutes to get your order processed the next working day! How did children in Ipswich help the war effort? Who was imprisoned in Ipswich for opposing the war? Where in the town was there thought to be a German military control centre? In this thoroughly researched and highly readable study of the Ipswich Home Front, Rachel Field’s latest book covers more than just munitions and mittens for the troops. Included throughout is a wealth of information on the life of civilians at home and at work, care of the sick and wounded, civilian contributions to the war effort and how people spent their leisure time. Military matters (in the air, at sea and on land) and how they directly affected local people are also explored, including Zeppelin raids on the town. 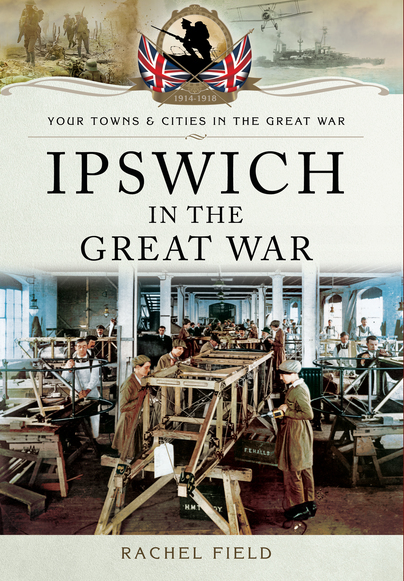 This is the first book dedicated solely to Ipswich in the Great War and includes many photographs and illustrations that have never been previously published. Packed with original research, personal accounts and fascinating local stories, the book charts many highways and newly discovered byways of life in and around the town in the war years. An absorbing quick read or one to refer to from time to time. It would be appreciated equally by a student as by someone who wants to become swiftly familiar with the Great War. A cracking read, really good. A brilliant book and absorbing read. very interesting as it deals with how Ipswich was affected. Rachel Field was born in Cambridge and has lived in Ipswich with her husband since 2006. She studied History at Warwick University. Her working life was mainly spent with a small research company, followed by a spell as an administrator for the National Autistic Society. Now retired, she has two adult children who, like most of her extended family, live close by in Suffolk. Rachel is also the author of the successful Ipswich Book of Days.